Stretching the One Income Dollar: Days Inn- Saskatoon, Sask. You know they say ‘if at first you don’t succeed, try again?” Well after our misadventures on our Memphis trip, Gerry and I are right back on the horse planning our upcoming trip to Philadelphia and Atlantic City. Since we live 6 hours from the airport, we usually try to arrange a hotel once we land from our trips. This time for our trip coming home we plan to stay at Days Inn Saskatoon. The hotel features a free café breakfast which is great for travelers looking to hit the road after waking up. An airport shuttle and wi fi/High speed internet which helps you stay connected while on the road. There is also an indoor pool, a whirlpool, and a fitness center if you need to relax-but hopefully this trip will not be as stressful as our last one. The rooms at the Days Inn feature all the amenities that travels have come to appreciate getting in their rate including internet, a fridge, coffee maker, cable television and a hair dryer-because you never know when you will need one. It is great to have so many conveniences and an affordable rate packaged together. 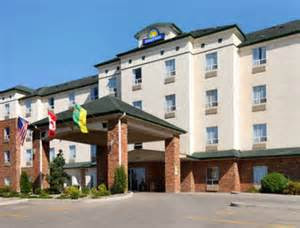 We look forward to our next trip and the stay at Days Inn, Saskatoon.